Objectives Immune checkpoint inhibitors (ICIs) targeting the cytotoxic T-lymphocyte-associated protein 4 (CTLA-4) and programmed cell death protein 1 (PD-1) pathways have demonstrated survival improvements in multiple advanced cancers, but also cause immune-related adverse events (IRAEs). IRAEs with clinical features similar to rheumatic diseases have not been well described. We report patients with inflammatory arthritis and sicca syndrome secondary to ICIs. Methods We report patients evaluated in the Johns Hopkins Rheumatology clinics from 2012 to 2016 identified as having new rheumatological symptoms in the context of treatment with ipilimumab (anti-CTLA-4) and/or nivolumab (anti-PD-1) for solid tumours. Results We identified 13 patients who received ICIs and developed rheumatological IRAEs. Mean age was 58.7 years. Cancer types included melanoma, non-small cell lung cancer, small cell lung cancer and renal cell carcinoma. ICI regimens included nivolumab or ipilimumab as monotherapy (n=5), or combination nivolumab and ipilimumab (n=8). Nine of 13 patients developed an inflammatory arthritis, 4 with synovitis confirmed on imaging (3 ultrasound, 1 MRI) and 4 with inflammatory synovial fluid. Four patients developed sicca syndrome with severe salivary hypofunction. Other IRAEs included: pneumonitis, colitis, interstitial nephritis and thyroiditis. Antinuclear antibodies were positive in 5 out of 13 patients. All 13 patients were treated with corticosteroids with varying response. Two patients were treated with methotrexate and antitumor necrosis factor therapy for inflammatory arthritis. Conclusions As ICIs are increasingly used for a range of malignancies, new cases of rheumatic IRAEs are likely to emerge. Further research is required to understand mechanisms, determine risk factors and develop management algorithms for rheumatic IRAEs. In recent years, harnessing the power of a patient's immune system to treat cancer has been an increasingly efficacious treatment strategy in oncology.1 Immune checkpoint inhibitors (ICI) targeting cytotoxic T-lymphocyte-associated protein 4 (CTLA-4), specifically ipilimumab, and programmed cell death protein 1 (PD-1), nivolumab and pembrolizumab, and the combination of ipilimumab with nivolumab have been Food and Drug Administration (FDA)-approved for the treatment of metastatic melanoma.2–4 In the European Union, ipilimumab was approved for metastatic melanoma in 2013,5 with pembrolizumab and nivolumab approved within the past year. Nivolumab and pembrolizumab are also FDA-approved for metastatic non-small cell lung cancer (NSCLC) in the second-line setting and for programmed death ligand 1 (PDL-1)-positive NSCLCs,6 and nivolumab has approval for the treatment of renal cell carcinoma (RCC).7 In addition, these and other agents targeting related immune pathways, including PDL-1, T-cell immunoglobulin and mucin domain 3 (TIM-3) and lymphocyte activation gene 3 (LAG-3), are currently being tested in a variety of cancers, from solid tumours to haematological malignancies.8 ,9 Hundreds of trials of ICIs are ongoing in the USA.10 Although ICI use continues to increase, consequences of these therapies as a result of inducing autoimmunity or through other mechanisms are only beginning to be understood. A range of immune-related adverse events (IRAEs) have been described with these agents, ranging from severe and potentially life-threatening pneumonitis and colitis, to autoimmune thyroid disease, hypophysitis and vitiligo.11 Rates of events have differed by drug and tumour type.11 ,12 Rheumatic and musculoskeletal IRAEs have to date not been widely recognised or well characterised. Recognising the potential for ICIs to cause IRAEs that resemble more classical autoimmune diseases will become increasingly important to rheumatologists as more patients are referred for evaluation and management, and to oncologists who must recognise these toxicities in order to refer. In this article, we report a series of patients evaluated in the Johns Hopkins Rheumatology outpatient clinics from 2012 to 2016 with inflammatory arthritis or sicca symptoms that occurred after the administration of ICIs. We report the clinical, autoantibody, radiological and functional features of these patients, including the oncological and rheumatological treatment they received, and their clinical course and outcomes. All patients were 18 years or older and treated for a malignancy with ipilimumab and/or nivolumab at the Sidney Kimmel Cancer Center at the Johns Hopkins Medical Institutions from 2012 to 2016 for metastatic melanoma, NSCLC or RCC. Patients were referred by oncologists when they identified new clinically important symptoms in routine care of patients in practice or trials. Cases were included only if rheumatic signs or symptoms developed after receiving therapy with ipilimumab and/or nivolumab, in the absence of known antecedent inflammatory arthritis or sicca syndrome. Patients underwent a comprehensive rheumatological assessment by a rheumatologist and were classified as having inflammatory arthritis based on history, examination and imaging findings as determined by the treating rheumatologist. Sicca syndrome was defined by the presence of severe salivary hypofunction on examination or functional assessment of salivary flow and/or severe dry eyes as determined by an ophthalmologist. Demographic data, other IRAE manifestations, treatment of IRAEs and response to therapy and articular findings were recorded by the examining rheumatologists and abstracted from medical records. Cancer treatment responses were defined by Response Evaluation Criteria In Solid Tumors (RECIST) 1.1 criteria13 as read by a radiologist on serial CT imaging. The reported laboratory studies are those obtained during the course of clinical care in clinical laboratories. Any imaging studies available in the Johns Hopkins system were also included. In addition, musculoskeletal ultrasound was performed on select patients by an ultrasound-certified rheumatologist. Six patients had melanoma, five had NSCLC, one had small cell lung carcinoma and one had RCC. The average age of patients was 58.7 years (SD 12), and 83% were male. Eight of 13 patients received combination therapy with nivolumab and ipilimumab; the remaining five patients received monotherapy with either nivolumab or ipilimumab (table 1). Seven patients had a partial response, five patients had stable disease and one had progressive disease (table 1). The median time to develop the first IRAE after exposure to ICIs was 3 months (range: 1–18 months) (table 2). Nine of the 13 patients had inflammatory arthritis. Clinical features of their musculoskeletal manifestations are described in table 3. The clinical presentation was variable between patients and involved both large and small joints in the upper and lower extremities. The initial joints involved were large ones for some patients, especially knees and elbows, while others had initial involvement of the metacarpophalangeal (MCP) and proximal interphalangeal (PIP) joints. When followed over time, six patients evolved to develop rheumatoid arthritis (RA)-like pattern characterised by bilateral synovitis of the PIPs, MCPs and/or wrists, along with larger joint involvement. Five of these patients were treated with systemic corticosteroids. Interestingly, most of these patients had profound inflammatory disease requiring much higher doses of corticosteroid therapy than initially anticipated based on their clinical phenotype. Also, the inflammatory arthritis persisted in some patients for months after ICI therapy was stopped. Patient 1 still had active inflammatory arthritis 6 months after his last infusion of nivolumab, and patient 2 had active inflammatory arthritis 15 months after her last infusion of ipilimumab and nivolumab. In these two patients, therapy was intensified to include tumour necrosis factor (TNF)-inhibitors, ultimately resulting in adequate control of their arthritis. Two patients had a clinical presentation similar to reactive arthritis. One of these individuals (patient 6) had dactylitis of one finger and large joint oligoarthritis with conjunctivitis and urethritis. His symptoms resolved when he was treated with infliximab and prednisone for colitis and did not recur. The other (patient 4) had urethritis and conjunctivitis followed closely by a predominantly large joint polyarthritis. He required doses of corticosteroids >1 mg/kg for 2 weeks before having any improvement in his articular manifestations. Adalimumab was initiated with considerable improvement allowing tapering of steroids. One patient had a large joint polyarthritis consistent with a seronegative spondyloarthritis (patient 7). He did not have synovitis of the PIPs or MCPs, back pain, enthesitis or extra-articular manifestations of reactive arthritis. He responded to 40 mg daily of prednisone therapy with symptoms recurring when he decreased below 10 mg daily. Imaging was conducted in four patients and confirmed the presence of inflammatory arthritis in each. Three had abnormal musculoskeletal ultrasound findings, and one had an abnormal joint MRI. Ultrasound demonstrated synovitis with erosions in the right talonavicular joint of a patient with seronegative symmetric polyarthritis (patient 2) similar to RA (figure 1). In patient 1, MRI showed tibiotalar and subtalar joint effusions (figure 2). Patient 3 had erosive arthritis and proliferative synovitis of the elbow by ultrasound at the time of his initial rheumatological evaluation (table 2). Initial plain films were negative for metastatic bone lesions, but he ultimately developed a metastatic lesion in the humerus, just proximal to the elbow. 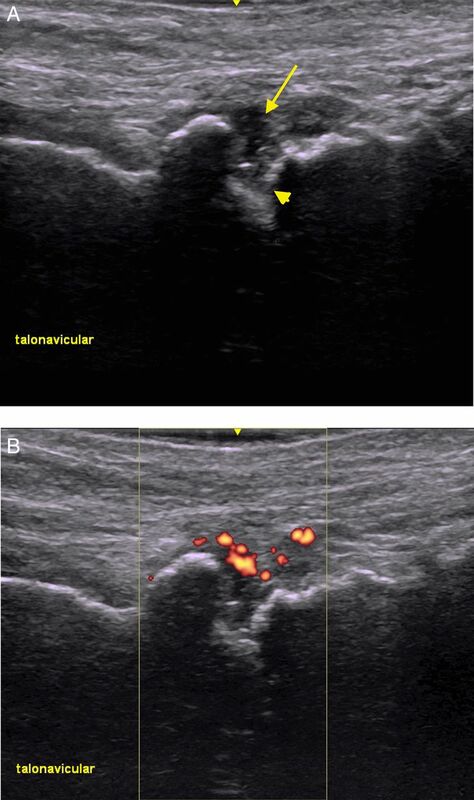 Ultrasound imaging of talonavicular joint showing erosions and synovitis. (A) Grey-scale ultrasound showing a hypoechoic focus (arrow) and erosions (arrowhead). (B) Power Doppler ultrasound showing enhancement of synovitis. MRI of left ankle. 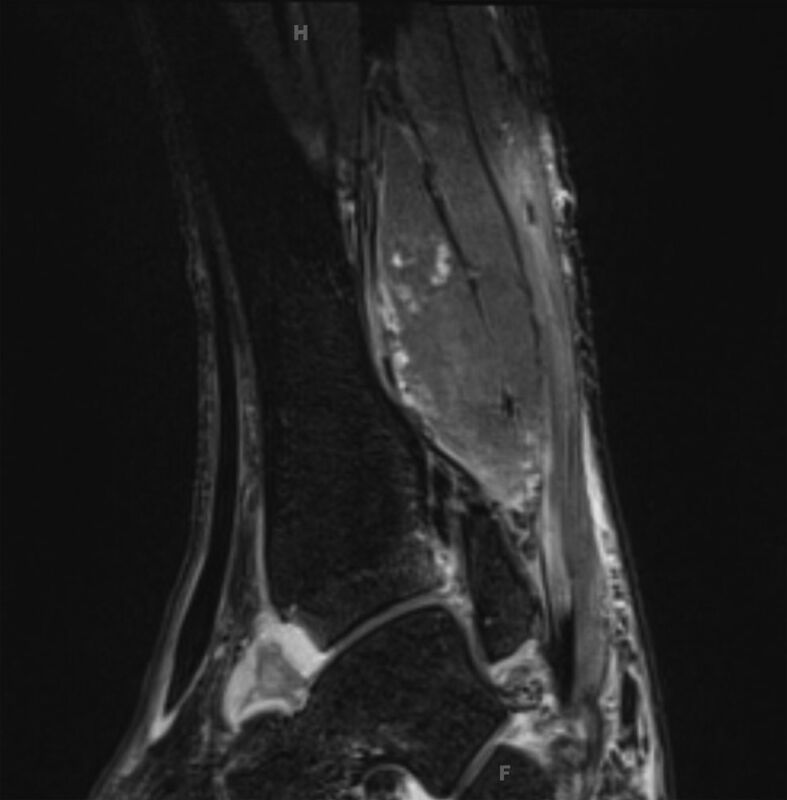 T2 fat-suppressed image showing tibiotalar synovitis. Four patients had synovial fluid analysis, each inflammatory (synovial fluid white blood cells range 9854–28 400 cells/mm3). All synovial fluids had a predominance of polymorphonuclear cells (>70%). Patient 7 had synovial fluid monosodium urate crystals, with a synovial fluid white blood cell count of 9854 cells/mm3 and a serum uric acid level of 5.7 mg/dL. However, his presentation was thought to be more indicative of a non-crystalline disease, given his failure to respond to colchicine, his polyarticular presentation and his ongoing requirement for high doses of corticosteroids (up to 40 mg/day prednisone). No patients with inflammatory arthritis were positive for rheumatoid factor (RF) or anti-cyclic citrullinated peptide (CCP) antibodies. Three of the inflammatory arthritis patients had antinuclear antibodies (ANA), only one with a high titre (table 2). Four of the nine patients with inflammatory arthritis also developed colitis during their ICI treatment. For three patients, the colitis preceded the arthritis, and in the fourth the colitis developed after the arthritis. Two of these patients also had reactive arthritis presentations, and one had symptoms suggestive of inflammatory back pain. Four patients had sicca symptoms that developed while on ICIs and could not be explained by other medications. All four presented with the relatively abrupt onset of severe dry mouth symptoms and had examination evidence of severe salivary hypofunction. One patient had concurrent bilateral parotid gland swelling which resolved with steroid therapy. On ultrasound imaging, she also had discrete hypoechoic foci occupying more than 50% of her parotid and submandibular glands, changes that are commonly seen in Sjögren's syndrome.14 One patient had a pre-existing history of severe dry eye disease, but no diagnosis of Sjögren's syndrome and no severe dry mouth symptoms. Two of the patients with sicca syndrome developed other IRAEs; pneumonitis developed in one patient and interstitial nephritis and colitis in the other. The pneumonitis, interstitial nephritis and colitis improved with steroid treatment. Three of four sicca patients had positive ANA; one patient had low titre La/SSB antibodies; but none of the patients had Ro/SSA antibodies (table 2). One sicca patient had a positive RF. One patient, who also had pneumonitis, had anti-EJ antibodies (one of the antisynthetase antibodies). He had no associated rash, Raynaud's phenomenon or proximal muscle weakness. Inflammatory arthritis and sicca syndrome associated with ICI use have been less commonly reported. Although arthralgia has been noted (in 5%–16% of patients treated with nivolumab in phase III studies for melanoma2 ,16 or NSCLC21 and in 11% of those treated with combination ipilimumab/nivolumab therapy,22 inflammatory arthritis is less commonly described. The current literature consists of case reports or small case series. Two cases of polyarticular seronegative inflammatory arthritis developing after pembrolizumab therapy were recently reported.23 One patient had a large joint arthritis, while the other had both large and small (PIP) joint involvement. Both patients lacked RF, CCP and ANA. In a retrospective review of imaging studies using CT and positron emission tomography (PET)/CT performed before and after treatment with anti-CTLA-4 therapies, 4 of 119 patients had evidence of new arthritis detectable on imaging.24 Limited clinical information was reported on these patients to further characterise them. To our knowledge, no individual cases of ICI-induced sicca syndrome have been previously described. Dry mouth was reported in 6.5% of patients in one phase I clinical trial of nivolumab,19 but has not been reported in larger clinical trials. In the current series, patients with sicca syndrome presented with abrupt and severe salivary hypofunction, suggesting an immune aetiology. The dry eye symptoms were less severe. Ro antibodies were not observed in the four patients with sicca, and parotid gland swelling and La antibodies were seen in one patient. Many of the patients we report had more than one IRAE. In this case series, colitis was the most common concurrent event; pneumonitis and thyroiditis were also seen. The sequence of IRAEs varied; some patients had arthritis or sicca first while others had IRAEs preceding the arthritis or sicca. Also notable was the short duration these subjects were exposed to ICIs before developing their first IRAE. In nearly all (12 of 13 cases), the first IRAE developed after 9 months or less of ICI therapy, with 62% occurring within the first 3 months and 23% in the first month following first exposure. The kinetics of the onset of IRAEs has been described for ipilimumab, with skin typically seen as the first manifestation, followed by colitis, and later hepatitis and endocrinopathies.29 For the rheumatic manifestations reported here, timing of onset ranged from 2 to 13 months after ICI exposure. Limitations of this study include the retrospective nature of the analysis, and that patients reported here received only nivolumab and/or ipilimumab rather than all currently approved ICIs. The patients included had symptoms of sufficient severity to be referred to a rheumatologist. There may be many patients with milder symptoms of rheumatic IRAEs who were not referred. Our sample of patients was also enriched for participants in clinical trials, as Johns Hopkins is a tertiary referral centre, and nivolumab has been Food and Drug Administration-approved for a short period of time. Patients receiving ICIs outside of clinical trials may be systematically different from those enrolled in trials, and they may also receive different monitoring by their clinicians. Additional cases of rheumatic IRAEs have been seen by our group, but could not be included in this series due to clinical trial embargoes and publication restrictions. There are many unanswered questions in the field of IRAEs due to ICIs. The diversity of manifestations of inflammatory arthritis, from type of joints involved, presence or absence of autoantibodies and presence or absence of erosive disease, demonstrates the need for careful baseline evaluation and following of these patients by rheumatologists. The complex phenotypes will not be understood without carefully cataloguing these patients. In addition, more work is needed to establish the incidence of rheumatic IRAEs. The denominator of patients treated with ICIs should be carefully evaluated so that the frequency of rheumatic manifestations can be understood and the risk of these events can be appropriately presented to patients. Finally, the rheumatologist's decisions on treatment for rheumatic IRAEs should be decided in conjunction with treating oncologists. It is unclear which disease-modifying antirheumatic drugs are safest or most effective in these patients. Given the grave prognosis of metastatic cancer, there is a higher acceptance of risk in treating IRAEs, with the goal of continuing ICI therapy. An example is the common use of TNF antagonists to treat the colitis associated with ICI therapy.31 The optimum dosage of corticosteroids is also uncertain as some patients in our series required doses as high of 120 mg of prednisone daily for relief of their symptoms, while others could be maintained on a much lower dose after an initial high dose. Collaboration between rheumatologists and oncologists will be instrumental to understand the spectrum of rheumatological IRAEs and their treatment. ClinialTrials.gov website: US National Institutes of Health. 2015 (accessed 27 Dec 2015).
. Standardizing assessment and reporting of adverse effects in rheumatology clinical trials II: the Rheumatology Common Toxicity Criteria v.2.0. J Rheumatol 2007;34:1401–14. Correction notice This article has been corrected since it was published Online First. The second author's first name has been corrected. Contributors LCC and COB planned the manuscript. All authors contributed to the composition and revision of the manuscript. JA obtained the ultrasound images for the manuscript. Funding This project was supported by Grant Number P30-AR053503 from the National Institute of Arthritis and Musculoskeletal and Skin Diseases. AAS is supported by grant K23-AR061439. LCC is supported through a Jerome L. Greene Foundation Scholar Award. Additional support was provided by a Jerome L. Greene Foundation Discovery Award to COB. Competing interests EJL, ANB and COB have served as consultants for Bristol-Myers Squibb. JRB has served as an unpaid consultant to Bristol-Myers Squibb. EJL also served as a consultant to Amgen and Merck. EJL has received research support from Bristol-Myers Squibb, Merck and AstraZeneca. JN has served as a consultant for Bristol-Myers Squibb and has received honoraria from Bristol-Myers Squibb and AstraZeneca. JRB and DL have received research funding from Bristol-Myers Squibb. Bristol-Myers Squibb provided no financial or writing support for this manuscript, but reviewed the manuscript for accuracy concerning patients who participated in clinical trials.